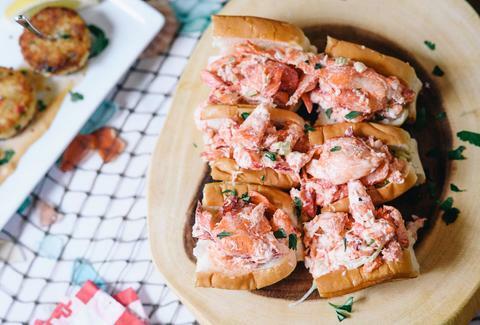 Our lobster rolls might not necessarily have the same reputation as Maine's, but Boston is no slouch when it comes to this seafood staple. 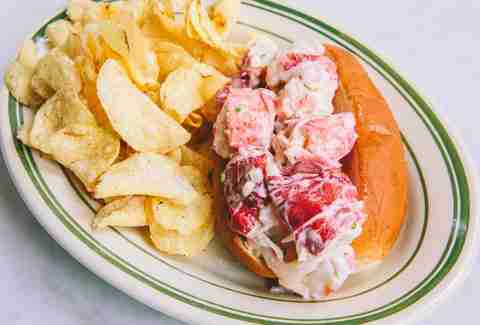 It's about time to show any skeptical out-of-towners what the city’s dining scene is made of with any of these amazing rolls that run the gamut from small and cheap to huge and expensive. The scene: The quintessential subterranean South End seat you covet. The meat: Hard-shell lobster meat cooked fresh daily from a full one-and-a-quarter-pound lobster -- so tail, claw, the whole deal. Roll: Pepperidge Farm hot dog bun toasted in butter. The mayo quotient: Made in-house and mixed with diced celery, lemon juice, salt, and fresh cracked pepper. 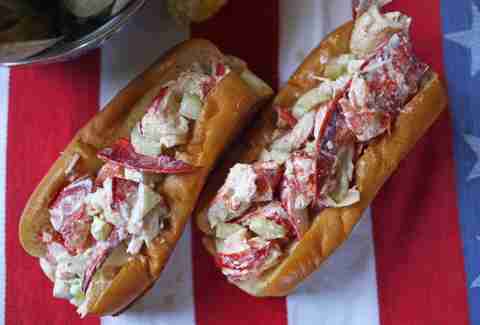 Dressed sparingly -- as Chef Stephen Oxaal says: It’s a lobster roll, not a mayonnaise roll. The verdict: You might forget to eat those kickass accompanying bread and butter pickles, so singularly obsessed you’ll become with the roll itself. The scene: The reservation you book a nanosecond after your friends and family book a summer trip to town. The roll: Hand-rolled brioche bun with chopped rosemary folded in, griddled to order. The meat: A balanced blend of tail, knuckle, and claw. All of owner Jeremy Sewall’s lobster is caught by his cousin off a dayboat in Maine. So, yeah, fresher than Doug E.
The mayo quotient: Hellmann’s -- score one -- enhanced by celery, pickles, red onions, and -- score two -- creme fraiche. The verdict: One of the most expensive in town, but completely worth it. Hearty thanks to Grandma Ethel for giving up her A-1 secret salad recipe. More hearty thanks to ICOB for offering the roll on both their lunch and brunch menus, too. The scene: A small water-adjacent spot -- the retail outlet of a decades-old lobstering biz -- that feels worlds away from the big-box restaurant mayhem nearby. The meat: All claw and knuckle, whittled down to bite-sized chunks. The mayo quotient: Negligible. This one lets the natural sweetness of the lobster meat shine through, amplified by a touch of tarragon. The verdict: Solid winner. Grab a beer and wait for your order at an outdoor table. 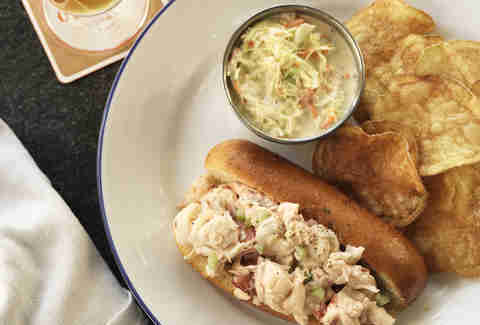 And don’t eschew the fried lobster roll, either: Our accompanying guinea pig ordered it, regretted it, then dumped drawn butter all over it and declared it his new favorite Dagwood. The scene: That double-wide trailer? 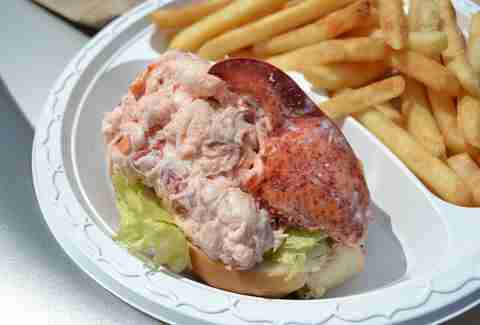 Home to the steadiest lobster bargain this side of the harbor. The meat: Nice balance of claw and knuckle. The roll: Traditionally an uncooked hot dog bun -- but they’re happy to toast it. The mayo quotient: Slightly sweet, but kept to a minimum. The verdict: The lack of a middleman means you can order these like you would a large pizza. Cost: $18.99 small, $23.99 large. The scene: Terrific weekend spot with industrial decor, on-point wine list, divine patio, etc. The meat: Chef Sewall’s at it again, but this time turns up the heat a notch. The warm roll is the way to go -- tail, claw, and knuckle meat steamed and chopped, then tossed with melted butter. The roll: A traditional New England soft roll griddled in clarified butter. The mayo quotient: What mayo? A touch of sea salt and you’re golden. The verdict: Should be a special treat but might become part of your regular rotation. Hint: rolls can be had at Sunday brunch and at the bar during the afternoon service between lunch and dinner. 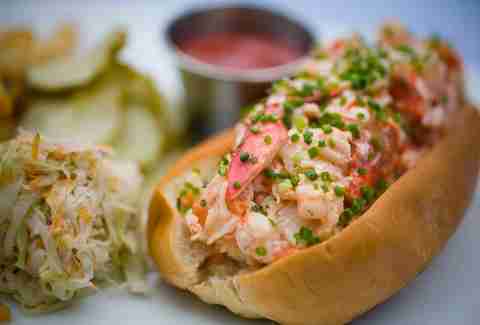 The scene: Airy yet intimate new Harvard Square seafood den with ample bar seating and a hidden alley patio. 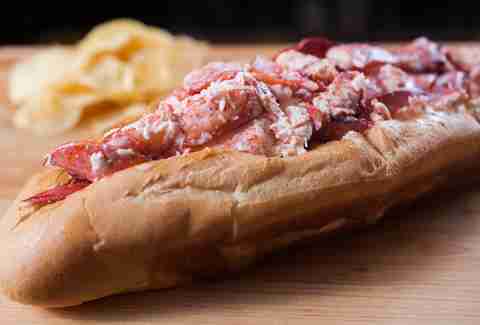 The meat: Mix of tail, claw, and knuckle, 6 ounces total (equivalent to one-and-a-half lobsters per roll). Oh, and the goods come straight from the 250-gallon tank in the basement, so you know it’s fresh. The roll: Brioche, griddled with butter. The mayo quotient: Negligible, but tasty. Meat is tossed with salt and pepper and a dab of in-house mayo, topped with chopped chives, celery leaves, and fresh lemon zest. The verdict: If you seek a simple, clean, perfectly rendered roll that lets the meat shine through, look no further. The fries are addictive, but you can actually do a half greens, half fries order to feel better about yourself. The scene: Slightly out of the way, but worth trekking out to this takeout spot with terrific views of the city skyline. The meat: Breathtaking in its volume. We’re talking a whole claw nestled atop a full half pound of meat, including copious chunks of tail. The roll: Almost swallowed up by the massive quantities of meat. But traditional grilled and buttered hot dog bun. The mayo quotient: The perfect dab’ll do ya. Add a little melted butter for a wee bit of a savory kick. The verdict: Rivals anything you’ll get on the Cape (watch your back, PJs). The scene: Lilliputian jewel of a seafood bar. Prepare to wait for an hour. The meat: An enormous pile o’ large-chunk claw, tail, and knuckle. But here’s the only thing you really need to know: get it “Connecticut style,” which means absolutely dripping with hot drawn butter. The roll: It says everything that this gargantuan brioche bun still manages to overflow with meat. Also, it soaks up all that extra butter for you. The mayo quotient: Fool. What did we say about the butter? The verdict: Skip your weekly 12-pack in favor of this deity. Cost: $31, on average, but subject to market prices. The scene: Wee, galley-like townhouse space with a limited number of tables and bar seats. And one of the hottest dinner seats in town, owing to the all-killer seafood lineup. The meat: Six ounces of tail, knuckle, and claw more than a Gloucester lobster’s worth. The roll: Straightforward buttered brioche roll. The mayo quotient: We recommend you go the hot-buttered route -- it’s just too delicious. Also, it comes with lobster roe on top. The verdict: It’s so buttery, so rich, so difficult to stop at just one. The house-made salt-and-vinegar chips on the side are the savory cherry on top. The scene: Another wee gem: historical, penny-tiled, simply adorned with a throwback neon sign out front. Also? Cast members from Game of Thrones and Stranger Things just dined here. We take that as an unassailable endorsement. The meat: We ate it too quickly to wonder. But there sure is a lot of it. The roll: Your classic split top. The mayo quotient: Repeat after us: brown butter, brown butter, brown butter. The verdict: No longer is there a need to schlep up to Portland’s Eventide for your brown butter fix. We’re calling this the best new roll in the city. The scene: Two-story, loft-like space with a huge open kitchen and the most gracious staff this side of the river. The meat: About 3 ounces of tail, knuckle, and claw. The roll: The most outré roll you’ll ever eat: a jet-black brioche made in-house with squid ink. And here’s the extra kicker: it’s baked not with yeast, but locally sourced sake kasu, lending it an ever-so-subtle sweetness. The mayo quotient: It ain’t mayo giving the salad that creaminess -- it’s mashed avocado and soy aioli, with chunks of Asian pear adding a touch of crunch. The verdict: First we were skeptical, then we were won over. 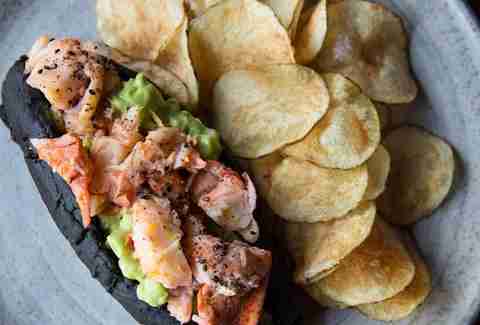 Avocado, aioli, and lobster meat are a winning combo, and the roll adds depth of flavor. 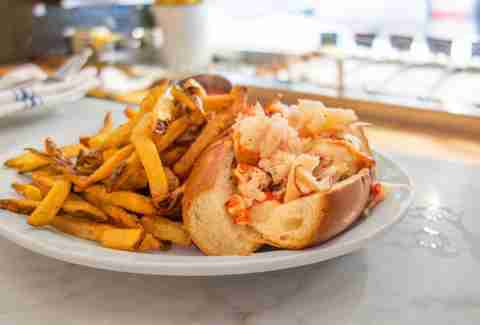 This shouldn’t be your first lobster roll, but if it was your last, you’d die super-happy. The scene: Key West by way of the Seaport. Old-school alfresco spot with iconic striped tent, picnic tables, and generous bar area with seats facing the harbor. Recent renos have added additional outdoor seating. The meat: The trifecta: tail, knuckle, claw. The roll: Brioche hot dog roll. The mayo quotient: A little dab’ll do ya, along with salt, pepper, and a little lemon. The hot -- aka “Naked” -- version is just as divine, with the meat actually poached in drawn butter rather than simply tossed. The verdict: Don’t pass this one over just because BC isn’t the new kid on the block (and admittedly touristy). The scene: Doesn’t matter (see below). But in brief, casual to the core. The roll: You can go with the 20-inch sub roll or be generous and split the two 10-inch rolls with a pal. 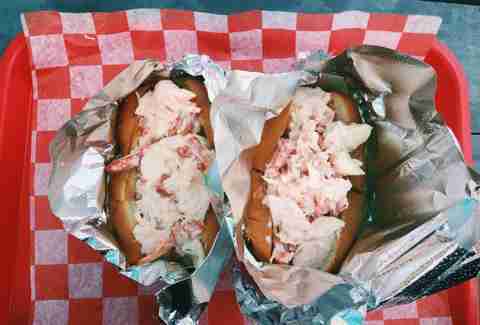 The mayo quotient: The meat is tossed in a combo of lemon juice, lobster broth, and mayo. Hot butter is an extra 2 bucks, but that’s basically a drop in the bucket considering the overall cost. The verdict: It’s the biggest roll in town and surprisingly good. Cost: Up to $69.99 for the 25-ounce version. Meaghan Agnew is a Boston-based writer for Thrillist.